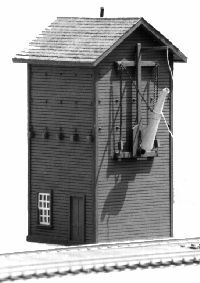 This water tower is a wooden HO kit for railway models. It is based on 2 water towers the CPR/E&N had on Vancouver Island. An original (real) water tower like this stands in Heritage Park in Calgary, Alberta, Canada.